Como sits at the southern end of the western branch of Lake Como in northern Italy. It's the most important town on the lake, with a long history, lively streets and a busy waterfront. Como has excellent transport connections, being just half an hour from Milan by train and only a few miles from Italy's border with Switzerland. Ferries and buses run up and down the lake's shores, and little seaplanes take off from the waters close to town. A funicular climbs up the hillside to offer panoramic views. Como isn't the most atmospheric or relaxing place to stay on the lake, but it is a practical overnight base and there's plenty to do. Even if you are simply passing through, it is worth taking a short time to see the town centre. There is a tourist information desk inside the bus station building over the road from Como Lago Nord railway station and close to the waterfront. The main tourist information office is in the central Piazza Cavour. Their free map with tourist information in English is a useful tool when exploring the town. At first glance, Como may seem disappointingly urban and sprawling compared with the smaller and prettier Lake Como resorts. But the town's setting - surrounded by green hills, with the end of the lake opening up as a pretty villa-rimmed basin just yards from the historic centre - is impressive and once you set foot within the square formed by the old town walls, Como's charms become more apparent. The centro storico, old town, is a typical Italian network of pavement cafes, little squares and picturesque lanes, some bustling with shops, others empty and peaceful. Como is definitely much livelier and more 'real' than the tourist-dominated villages around Lake Como. It has been a successful town since Roman times and has a sense of purpose independent of tourism. 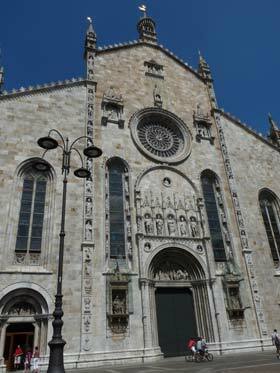 The most important sight in town is the cathedral, the Duomo. This imposing church was built over a period of several centuries, from 1396-1740, and shows a range of influences, chiefly Renaissance and Gothic. The facade dates from the fifteenth century, while the dome was designed by Filippo Juvarra in the eighteenth century. 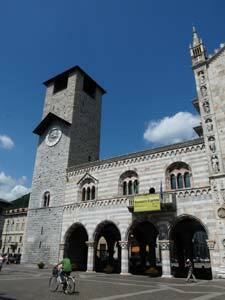 Alongside the Duomo is the Broletto, Como's thirteenth-century striped-marble town hall. Como is very proud of its famous sons. Two famous Romans, writers Pliny the Elder and Pliny the Younger, were born here and are commemorated with statues on the Duomo (their renown presumably outweighing the fact that they weren't saints or even Christians). Alessandro Volta, electricity pioneer (after whom the volt was named) is recorded with a piazza and a 'temple', the Tempio Voltiano, containing his equipment. Como is also proud of twentieth-century architect Giuseppe Terragni, who worked during the Fascist era, but died young. Various buildings designed by Terragni can be seen around Como; one of the most striking is his Casa del Fascio, now called Palazzo Terragni (pictured), just over a level crossing from the Duomo. If you are arriving by train at Como Nord Lago station, and don't have time to explore Como, you can see these two important buildings on either side of the tracks as your train is pulling in. Villa Olmo is one of the grandest buildings on Como's waterfront; a grand-fronted villa dating from the end of the 18th century. Nowadays it houses exhibitions and events. The gardens of the villa are open to the public. Como's football stadium is also on the shore of the lake, and must be one of the most picturesquely-sited in Italy. Como was an important town in the silk trade, and around the lake you'll still find shops selling high-quality Como silks. 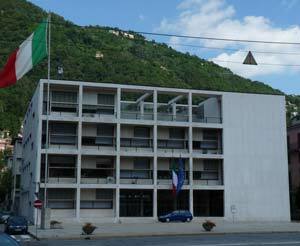 There is a museum dedicated to silk, the Museo della Seta, located just outside the centre of town. Other museums in Como include the Pinacoteca Civica, the town's art gallery, an archaeological museum and a museum of the Risorgimento. Note that museums are typically closed on Mondays and for a couple of hours in the middle of the day. A funicular railway, opened in 1894, runs up the hill from Como to Brunate. The two shuttles depart every 15 to 30 minutes, passing each other at the halfway point. At Brunate you can admire the views, take a stroll or even walk back down to Como. 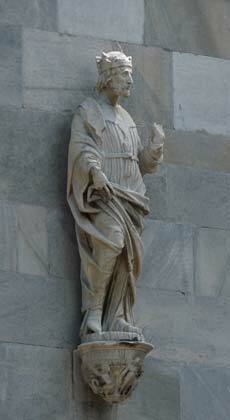 The Funicolare Como website (see links panel) provides timetables and suggests some walks and outings from Brunate. 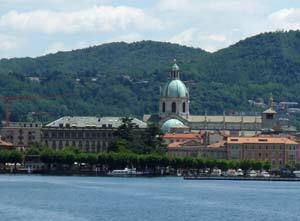 Naturally, most visitors to Como will spend their time exploring the lake stretching northwards from the town. Both buses and ferries run northwards from Como, connecting the lakeside settlements. There are other options for exploring though. Milan is a short train-ride away for those in search of some city life. And Como is only a few minutes' drive from the Swiss border and from Lake Lugano. There are two different railway lines serving Como town. One is the fast national railway with direct services to Milan's Stazione Centrale taking about 30 minutes. These trains, run by the Ferrovie dello Stato (FS), stop at Como San Giovanni station. The station is just outside the centre of town and up a long flight of steps (or around a curving road). It is within walking distance of the waterfront and ferries, but if you are travelling with luggage it would be easier to catch a bus from outside the station. Tickets and bus information can be obtained from the newsagents on the station concourse. A slower train service is run by LeNord, stopping at several small stations in Como and finishing right by the waterfront, at Como Nord Lago station. Trains run from this station to Milan's Cadorna station, and you can change at Saronno for the Malpensa Express to Milan Malpensa Airport. Como has a bus station over the road from Como Nord Lago station, near the waterfront. You can buy tickets and get timetable information here, though note that some buses stop a short distance away. The useful C30 bus to Bellagio stops by both the main railway stations. Local bus services are run by ASF Autolinee: see links panel for timetables. If you want to tour Como while you're passing through en route to the lake resorts, there is a left-luggage office in the bar of Como San Giovanni station. Since this is just outside (and uphill from) the historic centre, it's not the most convenient location, but could still be handy for travellers.